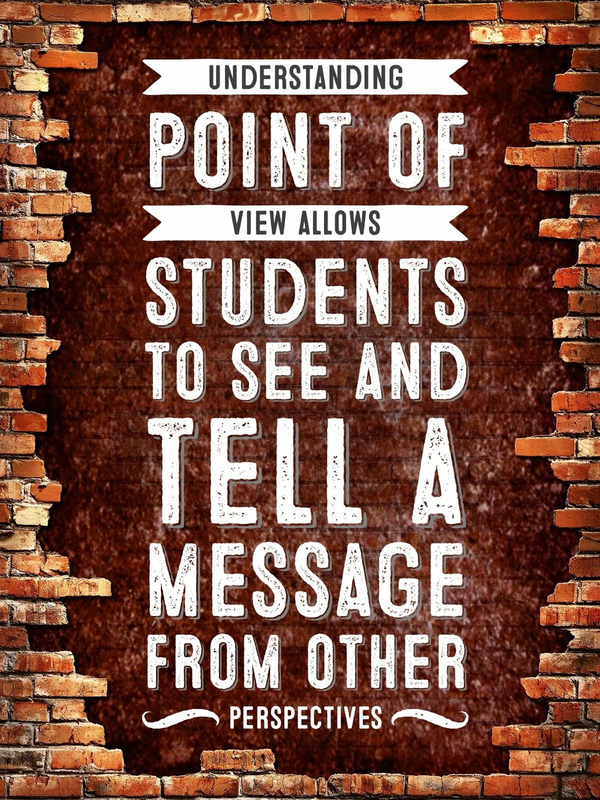 How to teach point of view in the Classroom. An essential reading and writing skill to understand perspective in English. Point of view refers to the type of narrator a writer chooses to use convey a message, whether fictional or nonfictional. It is important that students are able to accurately identify the main points of view commonly used in texts, both to gain a deeper understanding of what they are reading and to be able to answer common questions on standardized tests. To do this effectively, they must become familiar with the five most common points of view from which a text can be narrated. Before gaining experience in reading for point of view, students must have a broad grasp of the different types they will be likely to come across in their reading. This will help them to develop an understanding of the key factors a writer employs when selecting a suitable point of view for their writing. There are five main narrator points of view for students to understand here. Each comes with its own advantages and disadvantages for the writer, but before they understand these, students must be able to confidently identify each type. First person narration is told from the point of view of the writer themselves, or the point of view of a character (usually the main character) in the story. It is usually easily identifiable through the use of first person pronouns such as I, me, mine. In fiction, first person narration allows us direct insights into the thoughts and feelings of a character in the story. However, the first person point of view is popular in a wide range of nonfiction genres too, such as autobiography and reports. Here, the narrator speaks to directly to you, the reader, and tells you yourstory. It is identifiable by the use of second person pronouns such as you,your, yours. The second person point of view is most commonly seen in instruction writing, but it is sometimes used in fiction too, especially in interactive books such as adventure game books. This point of view sees the writer employ a character to narrate the story without providing insights into the characters own thoughts and feelings. It is a neutral form of narration that aims to provide an objective and unbiased point of view and is the default point of view for news reports. Identified mainly through the use of third person pronouns and people’s names, essentially this point of view is designed to inform. The third person limited point of view sees the story told from the point of view of a single character. It is generally identifiable by the use of third person pronouns and insights into the thoughts and feelings of the character. While other characters are referred to in the third person too, only a single character is followed in depth. This is usually, but not always, the main character. The keyword here is omniscient. This point of view offers the reader the point of view of a god. It can be differentiated easily from the third person limited point of view by the fact that the reader is afforded deep insights into the internal life of more than a single character. This is due to the narrator being privy to all the actions, thoughts, and feelings of every character within the text. There are also other possible points of view from which to narrate a story, first person omniscient for example, but these are used rarely. At times too, particularly in longer novels, points of view will alternate and shift from character to character through the course of the text. This requires the reader to make shifts in their own reading point of view as they work their way through the text. It is important for students to note the difference between dialogue and narration when identifying the various points of view used in texts. A common area of confusion for students can be where a character uses first person pronouns such as I,me, andmyin direct speech. On seeing these pronouns, many students will jump to the conclusion that they are dealing with a first person narrative point of view. This can be a mistake! Ensure students understand that in looking at a text to determine point of view, they are primarily looking at narration. You may find that students require a mini-lesson on what dialogue is and how it is punctuated if they are struggling to differentiate between the two here. Learning to recognize the different points of view in texts takes practice - and plenty of it! It is essential that we provide our students with a range of opportunities, not only to identify the point of view in operation, but also to understand what the selection of a specific point of view contributes to the written work overall. The following activities will help your students confidently identify the various points of view they will come across in their reading. This will give them the experience and confidence to use these various points of view in their own writing later on. This fun activity requires limited preparation and provides for a great time filler, as well as valuable practice identifying narrative points of view. Provide a variety of random books for students’ use (the library would serve as the perfect venue for this activity). Ensure there is a mix of fictional and nonfictional genres made available. In pairs, students examine a page of text and decide on the point of view being used. Remind students too that they must provide reasons for their choice. They can record their findings before moving onto another text. At the end of the activity, pairs can then present their findings to the class for discussion and debate. In the beginning, recognizing first, second, and third person points of view will be enough. As the students grow in skill they can begin to recognize the different forms of third person point of view. As mentioned above, when students begin to accurately recognize first, second, and third person points of view, it may become apparent that they have difficulty distinguishing between the different third person points of view: objective,limited, and omniscient. In this case, they will require discrete practice in this area to hone their third person identification skills! Students must understand that third person objective narrates action alone, while offering no insights into a character’s thoughts and feelings. However, students may have a problem in distinguishing between what constitutes thoughts and feelings and what can be defined as action. In this case, encourage students to approach the text with the mind of a movie director. If they were making a movie of the action in the text, can they film everything? If all the action in the text can be seen and heard and would therefore be easy to film, then the text will be third person objective. If, however, the text contains lots of content that would not easily lend itself to being filmed, these are likely to constitute the thoughts and feelings of the character. Then, the question will be do we have access to a single character’s thoughts and feelings - in which case the text will be third person limited. If we are granted access to a range of characters’ thoughts and feelings, then we are dealing with third person omniscient. Give students practice in this area by providing them with a range of texts written in the third person which they can then check against the above criteria. Initially, this activity will be most effectively performed in pairs or small groups where they can use discussion to cement their understanding. Soon, they should be able to sort the various third person points of view on their own with ease. Not all texts our students encounter come in the form of traditionally printed books. These days, students are exposed to an ever-increasing range of media that they must be able to decipher. From TV advertisements to video games, this technological age of ours presents students with points of view in diverse guises. Students must gain experience in reading these visual and multimedia texts in just the same way they would with more traditional texts. But don’t worry, you don’t have to seek the principal’s approval for students to bring in their games consoles just yet! Video footage of popular games being played can easily be found online, as can lots of TV advertisements. When students have grasped the basics of recognizing the main points of view in books, be sure to allow them opportunities to bring their newfound skills to bear on more modern media. Reading for point of view is an essential higher level comprehension skill our students must be given opportunities to develop. They must become confident in accurately identifying the various points of view, while also gaining experience in understanding the advantages and disadvantages of each. Developing student reading skills in this area will also reap benefits in their personal writing too. Not only do students need to be able to accurately recognize and utilize point of view to perform well in a wide range of standardized tests, but being able to appreciate the ways in which a narrator’s point of view informs how a story is told prepares the student to be a skilled reader of the world around them. And, in an age which sees students exposed to unprecedented amounts of information, being able to skilfully filter what we read for point of view has never been more necessary.